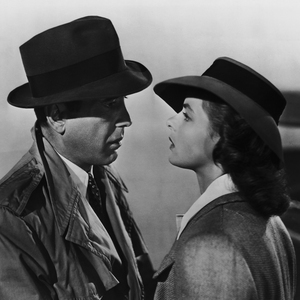 An undisputed masterpiece and perhaps Hollywood’s quintessential statement on love and romance, CASABLANCA has only improved with age, boasting career-defining performances from Humphrey Bogart and Ingrid Bergman. One of the most beloved American films, this captivating wartime adventure of romance and intrigue from director Michael Curtiz defies standard categorization. Set during contemporary World War II, it focuses on an Rick Blaine (Bogart) who must choose between his love for an old flame (Bergman) and helping her and her husband, a Czech Resistance leader, escape from the Vichy-controlled city of Casablanca. Hopewell Theater is taking reservations for its optional supper club on February 14 at 6:00 pm, prior to the 8 pm film screening of CASABLANCA. The menu for the Moroccan supper club can be found here and consists of an appetizer platter, a choice of entrée, and dessert. The 6:00 p.m. Supper Club and 8:00 p.m. movie tickets are $65 plus tax. Additional fees apply to online and phone orders. Click here to reserve tickets for the supper club, select your table and desired seats; at check out you will be able to select your entree type. All other seat types are for the film screening only – simply select your favorite seats. Tickets for the 8:00 pm film screening are $15 plus tax. Additional fees apply to online and phone orders. An afternoon matinee of CASABLANCA will also be shown on Saturday, February 16 at 2:15 pm. Matinee tickets are $6 plus tax at the box office. Additional fees apply to online and phone orders. Click here to reserve tickets for the afternoon matinee online. We hope to see you on Valentine’s Day for this very special night of food, film, and romance!